Devi (Chennai, India) on 2 December 2016 in Animal & Insect and Portfolio. @Jypyä Pop: Oh..has it got something to do with rain ? Do you prepare the film "Marathon Snail" ? Great shot! Such a beautiful little creature. @Tomix: :))) Yea..the floor looks like the sky and the stars too. actually, this flooring is called galaxy here...black with gold spots !! @Marjolein: Yes after half an hour ! Une magnifique série!! Celle-ci est très belle! Yeah, take it easy ! @Dimitrios: Yes..God has painted him beautifully ! Superb composition . Very beautiful ! @grouser: Thank you very much Grouser...Yes..Gold cup indeed for carrying his home on his back and winning the race ! Fabulous image with perfect light and angle. 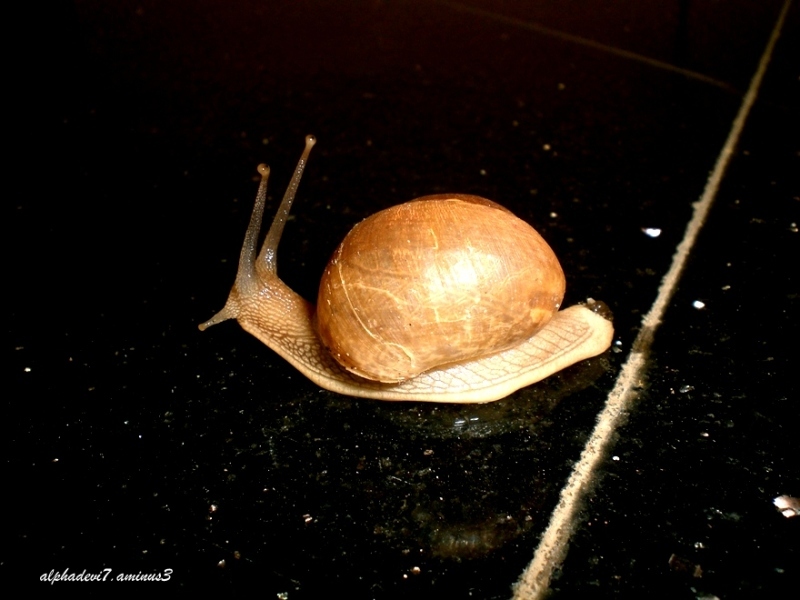 A great picture to show "slow but sure" as the snail crosses the line. Il a franchi la liogne doucemetn mais l'a fait. A beautiful animal. I like snails ... Great shot! What a sweet little snail this looks to be ! Ah, a great accomplishment! Cool shot. @Steve Rice: Thank you Steve !!! !